After five years of marriage, Cass Coyne has lost some of her boundless confidence. Her husband sees their ups and downs as normal challenges in a healthy relationship, but Cass lies awake at night wondering what you do when you need a break from your marriage? It comes as a shock to Jonathan when Cass persuades him to try a marital "intermission": a six-month separation during which they'll decide if the comfortable life they've built together is still the one they both want. Six months apart from their beloved dog is a different story, so they agree to meet once a month for a custody exchange. Time apart on opposite coasts makes the Coynes realize their problems may lie deeper than sweaty gym socks left on the bed and an empty container of milk put back in the fridge. Can a marriage experiment go too far for two people who once thought they had it all figured out? Elyssa Friedland is a graduate of Yale University and Columbia Law School and lives with her husband and three children in New York City. 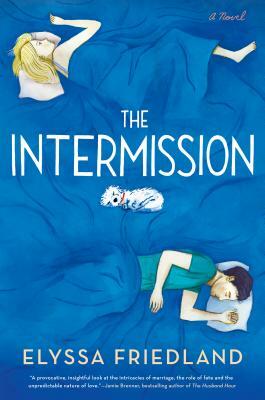 The Intermission is her second novel.